Human Cloning: To Ban Or Not To Ban? (TIME, June 16) -- It was going to be the congressional inquest of the decade. A journey deep into the addled soul of American politics. More FBI agents on board than tracked down John Dillinger. Enough big donors under oath to fill out a fund raiser. Even a man from Watergate swinging the gavel. 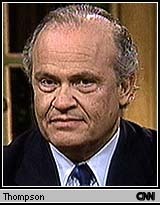 It would be must-see TV: Big Fred Thompson and his Donorgate hearings. But a month before the curtain is supposed to rise, the Senate hearings on campaign-finance abuse are shaping up like the movie Titanic, an ambitious production that Hollywood can't seem to bring to the screen. By last week Thompson, an ex-actor who was chief Republican counsel in the Watergate hearings, was still looking for the basic elements of political spectacle: star witness, clear story line, boffo ending. Virtually every principal figure on the foreign-money side of the scandal plans to take the Fifth or has fled--bankrollers James Riady, Charlie Yah Lin Trie and Pauline Kanchanalak are living in Asia, beyond the reach of subpoenas. Thompson may be hoping to fill in the blanks with a team of gumshoes he dispatched to Asia last Friday. But so far, committee sources tell TIME, the six investigators--two FBI agents, three G.O.P. staff members and one Democrat--have lined up appointments with only two bit players of the more than two dozen people they had hoped to interview. State Department officials tell TIME the China leg of the trip was canceled after the communist government refused to allow independent fact finding there. Instead Beijing promised to allow the team to meet with government officials to discuss in general terms the allegation that China funneled money to Democrats through a cast of Asian Americans. The panel had tried on its own to set up missions to four countries by going from embassy to embassy in Washington. But foreign governments insisted on working out approval for this through the State Department--a basic piece of protocol that Thompson finally acceded to. Last week his committee got worse news. The most compelling new development in the foreign fund-raising scandal centers on a donation to Thompson's party. According to documents turned over to Senate investigators on Friday, then G.O.P. chairman Haley Barbour discussed the possibility of helping a Hong Kong tycoon get business in China if he forgave a $2.2 million loan to a Republican think tank. Barbour has denied this latest allegation. Thus what has already been an unwieldy probe, with its shifting geography and characters, has the makings of a p.r. nightmare for the G.O.P. The oft-delayed opening of the hearings, last set for July 8, seems likely to slip again--perhaps to July 15 or even September. The Democrats can take much of the credit: first, they forced a strict Dec. 31 limit on Thompson's hearings and sharply cut the funds for Congressman Dan Burton's probe in the House. And lately the most telling shots in this guerrilla war have been called by the White House itself. The President's defense team operates with a bunker mentality, scrawling messages in erasable marker to avoid the net of subpoenas. At 8:45 every morning, the "senior command"--a dozen lawyers, political aides and spokesmen--meet in the office of deputy chief of staff John Podesta to project where the Republicans are heading and how they can be headed off. They have managed this with the collaboration of Senate Minority Leader Tom Daschle while still providing most of the documents Thompson has sought, as well as dozens of interviews. And playing offense, the Democrats have asked to subpoena records of G.O.P. groups to delve into their fund-raising tactics. What delights the White House is that so much of what went wrong in last year's Democratic campaign is almost impossible to reduce to TV sound bites. And what frustrates Thompson is that anything about illegal foreign cash and straw donors that can be condensed has already been splashed on U.S. front pages since October. Virtually every hot document the White House turned over to him has been deliberately released to reporters by the Administration. Last week the White House struck again. A story Thompson was eyeing as a centerpiece involved Roger Tamraz, a major Democratic donor who wants to build an oil pipeline from the Caspian Sea to Turkey. Part of the story broke in March in the Wall Street Journal: the CIA was allegedly enlisted by Democratic chairman Don Fowler to facilitate a National Security Council meeting for Tamraz, who was seeking the U.S.'s blessing for his project. Republicans hoped that juicy details, still buried in White House files, would show "how the system went awry," in the words of one. On Tuesday night the West Wing "push-out" squad told reporters that while Tamraz failed to win U.S. support, he got far on his campaign connections. After meeting Tamraz at a March 1996 fund-raising event, Clinton asked counselor Mack McClarty to "follow up" on the oil financier's proposal. Later an Energy Department official interceded with the NSC, citing Tamraz's pledge to double the $200,000 he had already given Democrats. "We've taken away their first day of hearings," a White House aide said. A G.O.P. committee source agreed: "The Democrats have done this brilliantly." Thompson, who has an eye on the White House himself, is discouraged but not defeated. "We've been stonewalled," griped committee spokesman Paul Clark, but he added, "There's still important material we haven't got" and "700,000 pages of documents to go through." Yet the sense of a lost opportunity is starting to infect the G.O.P. troops. "If the hearings are a success, fine, Thompson gets the credit," said a House leadership aide. "If they sputter and don't produce anything, Thompson gets the blame."